Cooperative spectrum sensing schemes proposed to solve the hidden terminal problem and mitigate multipath fading and shadowing effects, which enhance the sensing performance and throughput in cognitive radio (CR) neworks. However, increasing the number of cooperative SUs leads to more communication overhead, which will increase the energy consumption of the CR network. 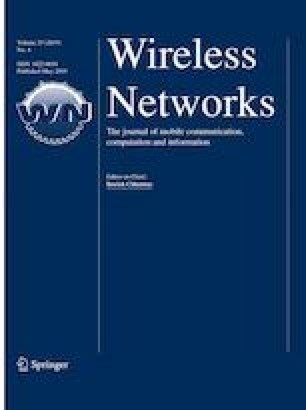 In this paper, a new scheme is proposed to solve the joint optimization problem of the sensing time, the detection threshold and the selection of the sensing and data transmitting secondary users (SUs) for improvement of the throughput and minimization of the energy consumption of the CR network under the constrains on the global probability of detection and global probability of false alarm. For these purposes, we find the optimal values of detection threshold and sensing time such that the detection constraints are satisfied. The convex optimization methods are used to determine the sensing and data transmitting SUs. The simulation results show that there exists the optimal detection threshold and sensing time for selected sensing and transmitting SUs that can improve the average throughput and minimize the energy consumption of the CR network in comparison to other schemes.